Canadian Prime Minister Stephen Harper says his anti-terror legislation will protect Canadians from terrorism, but it will also put the country’s Indigenous women at greater risk than ever before. While continuing to deny that the murder of over 1000 Indigenous Canadian women since 1980 suggests any wider “sociological phenomenon,” Prime Minister Stephen Harper is using the deaths of four Canadians in domestic terror attacks to bring a controversial new “anti-terror legislation” into law. As evidence of the threat that terrorism now poses to the country, Harper and his ruling Conservatives have cited two domestic terror attacks in Canada last year as well as December 2014’s hostage-taking in Sydney, Australia. 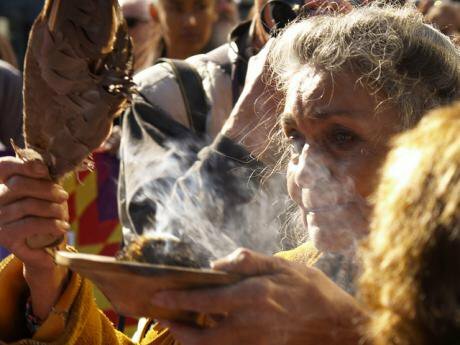 Many people believe that the bill will also have a chilling effect on the work of Indigenous rights advocates, environmental protesters, and anyone advocating views contrary to the ruling government’s agenda. 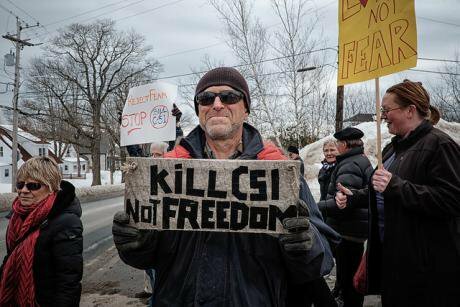 Bill C-51 Day of Action in Bridgewater. Photo: John McCarthy via Flickr. Francois Lavigne began his career with the RCMP, eventually joining CSIS following their inception in 1984. In an interview with right-leaning newspaper the National Post, even Lavigne said the bill is unnecessary. Or due to institutionalized racism. “Our activists are our voices, right? …If we stifle the progress they could make then he’s just taking away from our voices again,” she says, referring to Prime Minister Harper. In the autumn of 2014, Holly Jarrett uploaded a video of herself wherein she tells Canadians that while Aboriginal women make up 3.4% of the country’s population, they have accounted for a staggering 24% of murder victims in Canada over the last 30 years. In the video Jarrett also honours her own murdered cousin, Loretta Saunders. Like Jarrett, Saunders was an Inuk woman from Labrador. At the time she was murdered, Saunders was completing her honours thesis at Dalhousie University in Halifax; the topic of her thesis was missing and murdered Indigenous women. Campus protest 2011. Photo: Toban B via Flickr. In a question that became the title of a viral social media campaign, Jarrett invites viewers to contemplate the question that plagues Canada’s Indigenous women: “Am I next?” The video also directs viewers to Jarrett’s change.org petition, asking the Canadian government to hold an inquiry into missing and murdered Indigenous women. With much of the discourse around the bill focusing on its potential effects on environmental activism, I asked Jarrett if the bill would further imperil the safety of Indigenous women in Canada. CSIS would also acquire the permission to “disrupt” suspected terror activity both within and outside of Canada. Background documents cited by the CBC included the examples of obstructing travel plans or financial transactions, or interfering with the websites and social media accounts of suspected radicals. The legislation itself does not include a definition of what “disruption” might include, meaning the exact nature of any disruptive activity will remain open to interpretation if the bill is adopted. While it is against the law to encourage someone to commit a specific terrorism offence, another change would make it punishable by up to five years in prison to promote terrorism or intentionally advocate it. At the same time, government officials are insisting that they are not making it illegal to glorify terrorism. Further research into the Conservatives’ rhetoric only complicates matters. After a plot for a mass shooting in a Nova Scotia mall was discovered and foiled, Mackay was quick to clarify that this was not an act of terrorism because, he asserted, the planned attack did not appear to have been “culturally motivated.” Dare we ask how Mackay defines a cultural motivation? Last year’s tragic attacks were both conducted by a lone perpetrator, and both perpetrators had been identified by authorities as persons of interest who had been radicalized. However it has also been alleged that the Parliament Hill shooter, who is known to have had a history of crack addiction, was mentally unwell too. This suggests that the attacker’s radicalisation was one among a host of factors likely to have influenced the man’s behaviour. Regardless of the perpetrators’ motivations, statistically speaking Canadians are fortunate to live in a country where the threat of such terrorist attacks remains at a very low level. Perhaps more important than this, though, is the fact that there are some Canadians for whom Canada itself is the threat. 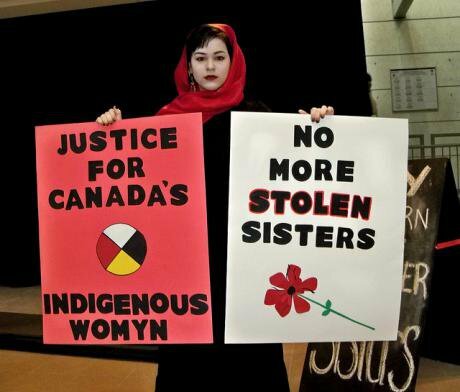 According to the Royal Canadian Mounted Police’s own report, Aboriginal women represent 16% of Canada’s murdered women, and 11.3% of its missing females cases. Bill C-51 has sparked protests across the country, and it has also been denounced in a letter signed by four former Canadian prime ministers as well as five former Supreme Court justices. Missing Women Inquiry protest, Vancouver 2011. Photo: Wayne G via Flickr. Dr. Pamela Palmater is a Mi’kmaw lawyer and professor, and a member of the Eel River Bar First Nation in New Brunswick. Palmater holds the chair in Indigenous Governance at Ryerson University in Toronto, and is a high-profile advocate for Indigenous rights. On March 24, Palmater appeared as a witness before Parliament in the House of Commons’ Public Safety Committee hearings to obtain feedback on Bill C-51. In her testimony Palmater argued forcefully for the bill to be thrown out, stating that under C-51 Indigenous people’s ability to advocate for their rights and protest against laws could constitute insurgency. Underscoring her point, Palmater reminded the committee that there was a time when it was legal in Canada “…to take Mi’kmaq scalps” and to confine Indigenous people to reserves. Palmater is an advocate for Indigenous nationhood and she has said that she could easily fall afoul of C-51. “My declaration of sovereignty – that kind of material on my computer – could be considered terrorism, a threat to national security because it’s a threat to Canada’s national security,” she testified. Palmater’s testimony is based on more than speculation. In an interview with the CTV News program Question Period two days before testifying against the bill, Palmater was asked to comment on the repeated insistence of Canada’s Public Safety Minister Stephen Blaney that the bill would not pave the way for CSIS or the RCMP to spy on high-profile advocates like her. Thinking of this, I asked Holly Jarrett how the Am I Next campaign might look if it were begun under Bill C-51. “It’s hard for me to speculate and to be honest with you…I try not to speculate too much because I try to deal in the ‘now’ when I’m campaigning. But had this bill been in effect I possibly could have been charged for speaking out against our government. I possibly could have been charged with speaking about any kind of an act that would…lead to an uprising kind of event. “So, then we’ve got women who are taking their picture for that whole campaign, and what would we have done? Would we have said ‘you can’t do this because that’s a terrorist act?’…I know that it’s a serious thing and I don’t want this to sound ignorant, but some of the things that Harper does, they’re just laughable. If Harper has his way, all Canadians might find themselves with an unsettling new reason to be looking over their shoulder.